Despite a baggage handler ramming (and thus disabling) our plane, we got to the Crescent City in time to enjoy dinner at Herbsaint, one of our two favorite Donald Link restaurants (I think he started this one with Susan Spicer). Duck confit w/ dirty rice and an amazing appetizer of spaghetti with house-cured guanciale and a fried, poached egg, along with a kickass burgundy eased the stress of traveling. (The pre-dinner Haitian daiquiri helped, too). Friday, the weather was Fest perfect and Jon and I started out traditional way, with Mardi Gras indians at the Heritage stage. Semolian Warriors led to the Real Untouchables Brass Band and then into the marvelous Creole Wild West Mardi Gras Indians. Creole Wild West is one of the oldest "gangs," and to my mind, Big Chief Walter Cook looks sort of like Jon. I'll see if I can dig up a picture. Didn't see Tom Morgan - the WWOZ disc jockey who has been our source for all things Indian - at first, but he showed and told us he was busy gathering material for the WWOZ Jazz Fest Blog. Saturday started fine. More Indians (the Black Seminoles) and Bourbon Street survivor Carol Fran (old enough to have Ben Sandmel playing drums), and the kickass Mahogany Brass Band working a groove and telling us, "That's just love raining down." The incomparable Eddie Bo was in fine form, singing and dancing and making us dance to such indescribable loose funk as "Check Your Bucket" even as the rain got heavier. Ducked out of what we thought would be the heaviest part of the downpour, ended up chatting with Chief Darryl Montana, who was in the grandstand, explaining some of his Indian suits (that's him on the left), which were on display. 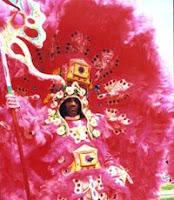 (He's Big Chief "Tootie" Montana's son: check this out.) But the rain continued to fall, so we ditched some of our plans (Warren Storm, NewBirth Brass Band) and sheltered at the blues tent for the Ponderosa Stomp Revue. Lasted until we got to hear Archie Bell "Do the Tighten Up," and dashed for the buses, soaked to the bone. Well, that was it for the Fest for us. But Monday night brought us uptown to Tip's, to Instruments a Comin', one of the Tipitina's Foundation's benefits. Little Feat, Radiators, Ivan Neville's Dumpstaphunk, and a smoking set by the incomparable Rebirth Brass Band. (Have I used "incomparable" yet in this blog? Let me just say that any band that can have me bouncing up and down and screaming "REBIRTH GOT FIYA!" in the wee hours of the morning, long after I'd thought I'd hit the wall, is pretty good.) You can hear clips here. Tuesday, the wierd, wild, and woolly Ponderosa Stomp, a now annual showcase of R&B, rock, rockabilly, and blues antiques, one-hit wonders, and other oddities. Yeah, the revue sucked us in for more. Hey, did anyone else know Mary Weiss of the Shangri-Las was performing again? Granted, her voice isn't what it used to be, but yes, she did sing "Leader of the Pack." Honestly, though, I thought Barbara Lynn and Betty Harris kind of showed her up, with showmanship making up for some of the notes lost over the years. Oh, what else? Jon Cleary at the Louisiana Music Factory turning "Tipitina's" into a Caribbean jam. Finding a 1924 edition of two John Galsworthy short stories at the wonderful Beckham's Bookstore.Marcia sitting in with Irma Thomas. Dinner at Cochon, Donald Link's more country-style outlet (house-made boucherie sampler!). Did cruise through the Lower 9th again. It's shameful. Except for a few houses built by church groups, there's nothing. Living in one of those six or eight houses must be like living on the prairie in the 1800s. Nothing from the government. Nothing. On a happier note, the Habitat for Humanity Musician's Village that Jon and I volunteered on is now a real neighborhood! Lots of houses, at least one new street. Gardens. Bikes on the porches. Wind chimes. And, yeah, the rest of the Upper Ninth Ward seems to be on its way. Every third house still looks empty, the rescue markings still spray-painted on the front. But others are coming back - construction everywhere. Again, all private charities, churches, and personal initiative. Nothing from the government. Not to end on a sad note, we did sneak in a brunch at the Court of Two Sisters before we took off. 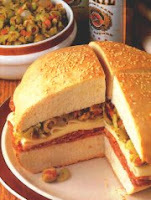 And, yes, took a muffaletta on the plane for a late dinner back home. PS. The trade paperback of Cries and Whiskers came out. Sweet! PPS. If you can't be there, try "The World That Made New Orleans," Ned Sublette's wonderful new book.